I didn't really get a chance to finish updating this while we were away, so I'll quickly summarise the rest of the holiday here. 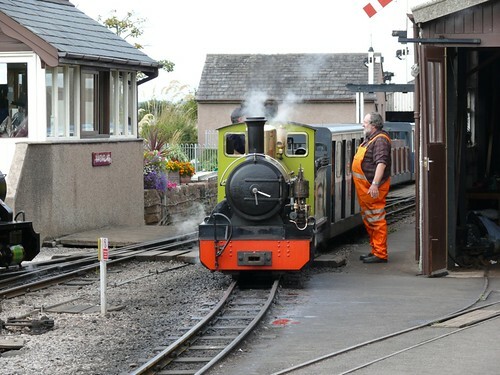 On Tuesday, we went on the Eskdale and Ravenglass Railway, otherwise known locally as La'al Ratty. It's a small steam line (3 foot gauge) which runs up the Esk Valley and conveniently stops just down the road from Boot. 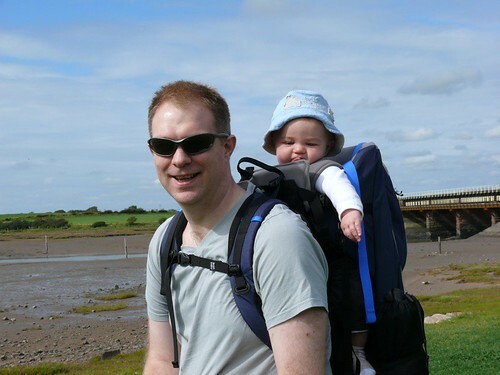 We got Nathan into his new Bush Baby carrier and headed off on our expedition to Ravenglass. The first 25 minutes of him in the carrier were killers, as I rediscovered muscles that I haven't used for a long time. Nathan waiting for the train to start. I'd taken the OS maps of the area with me (more awkward than usual as the valley runs on the edge of two maps) and followed the journey as we went. It was great fun, although I recommend a jumper if you are in an open coach! The views were great. Jill was looking for Thomas the Tank Engine when she took the picture above! 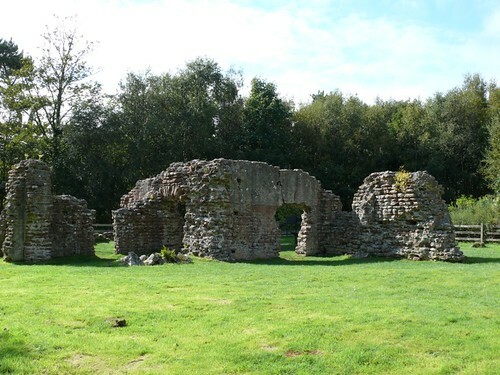 Once we arrived in Ravenglass, we headed off out of town along the road to the Roman Bath House Ruin that's there, at the edge of the site of an old fort. Back in Roman Britain, Ravenglass was quite an active port. 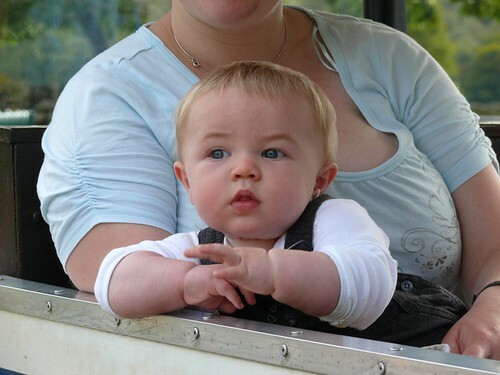 Nathan had great fun as we went along, grabbing my shoulders and trying to steer me along. Nathan riding his Daddy's back! The bath house was quite a substantial ruin, in a state similar to some older castles I've visited in the past, but beyond a plaque and a space to walk about there wasn't an awful lot to do except use your imagination. Now, Roman times were one of the periods of history that fascinated me (I'd have done a Classics A-Level had the school not stopped me) so it wasn't too hard to do, especially as you could clearly see the edge of the old fort from the trench and rampart that ran around it in the adjacent field. However, it was the kind of place that you spend thirty minutes at (maybe more with a picnic) rather than the full on Roman experience like Herculaneum or even the fort in the Hardknott Pass. This picture shows all the ruins of the Roman Bath House. The trip back was great, and Nathan managed to fall asleep. We were sitting just in front of a group of rail enthusiasts who were cycling the old rail routes to see where everything used to go. I was fascinated to hear some of the technical details. 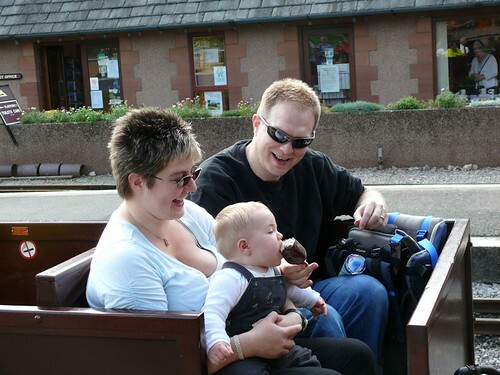 They also took a lovely picture of Nathan showing his new interest in ice cream. Moments after he made a grab for my Magnum Classic! 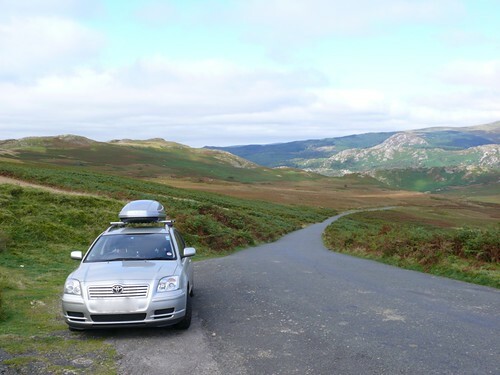 The next day saw us travelling across to Windermere, via Sawtry and Beatrix Potter's old farm Hill Top, and the ferry. When we got to Bowness we visited the Beatrix Potter Experience, which was great and is definitely the place that I would recommend if you;ve got children who are into Beatrix Potter. Fortunately, Nathan and I managed to guide Jill through without her getting too excited. The café here was much better that the one on the railway, although the setting was a little less attractive. Thursday saw us in Whitehaven, which was my old stamping ground when I was up in the Lakes working. It isn't much to look at, and even the improvement activities seem to have gone a little shabby, but there are real gems here. The place used to be one of the major ports in the UK (indeed, Cunard started here and moved to Liverpool later) and it's one of the few places to have been attacked by a foreign power in the guise of the US Navy during the War of Independence. One of their great heroes, John Paul Jones, led the raid here. There are other links, but you need to look below the surface rather than take the place at face value. I'm guessing the closure of one of the town's two main employers in 2005 hasn't helped the place. 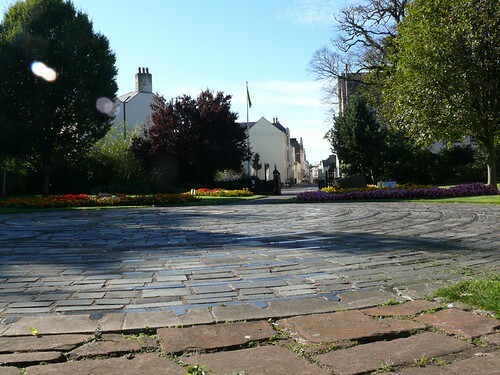 An old Churchyard in Whitehaven, showing the spiral created for the Millennium celebrations. Anyway, the really good reason to visit Whitehaven still remains; Michael Moon's Antiquarian bookshop on Lowther Street. The place is fantastic, a deceptive in size like Doctor Who's TARDIS. If you like books, you should visit this place. There's a great review of it here in Sam Jordison's blog. After we finished at Michael Moon's we went for a walk around Whitehaven, and then we headed out of town to nearby Cleator Moor, where we met up with some old friends, Howard, Paula and their daughter Mary-Jane. They're a little ahead of us (MJ is 16 months old), so we had a great time catching up and exchanging tips. Nathan behaved himself, and we got him into the car asleep when we headed back to the cottage and the effective end of the enjoyable holiday. The Ulpha Fell road on the way back to Yorkshire. It's worth mentioning that we had two very nice meals on the journey from and to home at a pub called The Plough, at Lupton. This is the end of the A65 just between Kirkby Lonsdale and the M6, near Kendal. Well, it's Day 3 in the Boot Village House, sorry, Cottage and much has happened. Sunday dawned overcast after heavy rain during the night, but we didn't let that put us off! It was Roy's (Jill's father) 60th Birthday and we'd booked a table across the road at the Boot Inn for a slap up lunch to celebrate. 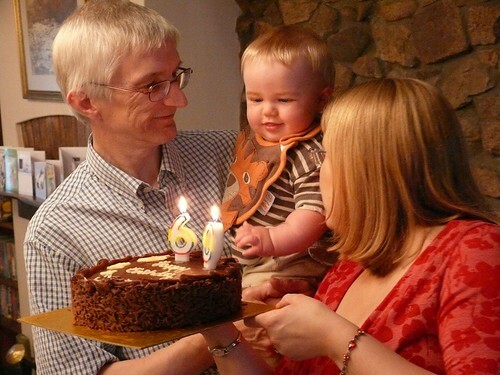 However, before that we started with cards and dangly 60th birthday signs that Nathan loved. He loved them for perhaps the wrong reason (for pulling off the numbers when he was on his walker) but he loved them never-the-less. Roy's 60th Cake supervised by Nathan and his Aunty Paula. The meal was fantastic, with high points being Nathan singing, Nathan being introduced to Simba the Ginger Cat, and the meal itself. Mine – the infamous Boot Pie – nearly didn't make it as it tumbled to the floor on the way to our table, but fortunately, they had one in reserve. I took pictures, but had the usual challenge with Jill's family all trying to avoid the camera and the chance of a decent group shot was somewhat minimal. The food was fantastic, with great taste, flavour and serving size, and fine beer to accompany it. I was nearly in trouble when I bought Roy a half of Guinness as well as his Sherry, but fortunately it dodn't set his stomach off. Eskdale Mill in Boot Village. 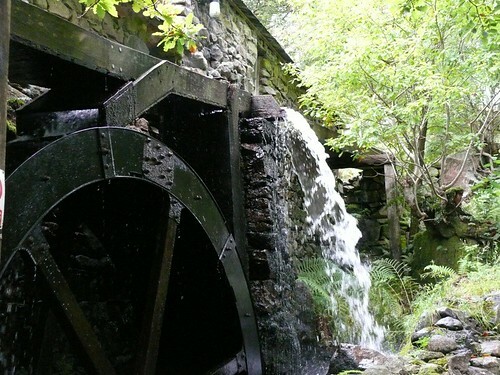 After the meal, we went for a walk to Eskdale Mill, which is a working flour mill driven by water just up the road from the cottage. It was fascinating, as the technology is pretty much as it was a hundred years ago. The Miller was scathing about the National Trust's approach to preservation – preferring a working route himself – and the fact that teachers seem to want to take kids around places like this. Personally, I thought it was great, but I can understand why younger children would be a liability around the place. It'd be perfect for for older kids doing CDT to set off a project. Unfortunately, demonstrating that they meet current hygiene legislation would be near impossible so they can't actually do anything with the flour they make. We left to walk some more to the church near-by, while I pondered whether they had to meet lifting gear and machinery guarding regulations or if there was some kind of exemption. The view from the fort in the Hardknott Pass. Next day (Monday), we had a mini-drama with water leaking from the ceiling. Hopefully resolved by the agent, but we'll find out tomorrow. The afternoon saw us traveling up the Hardknott Pass, stopping off at the Roman Fort. The views were gorgeous, as for once it was brilliant sunshine. Usually when we get there it's raining! 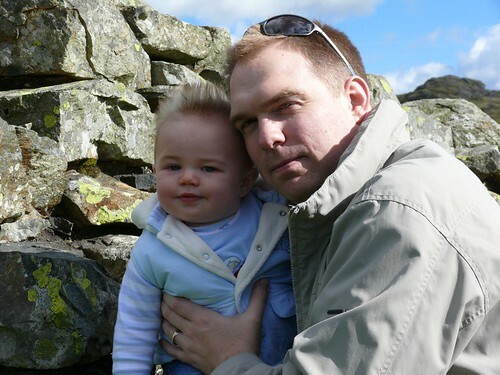 We visited the place we always do and got some wonderful pictures of Nathan with windswept hair. 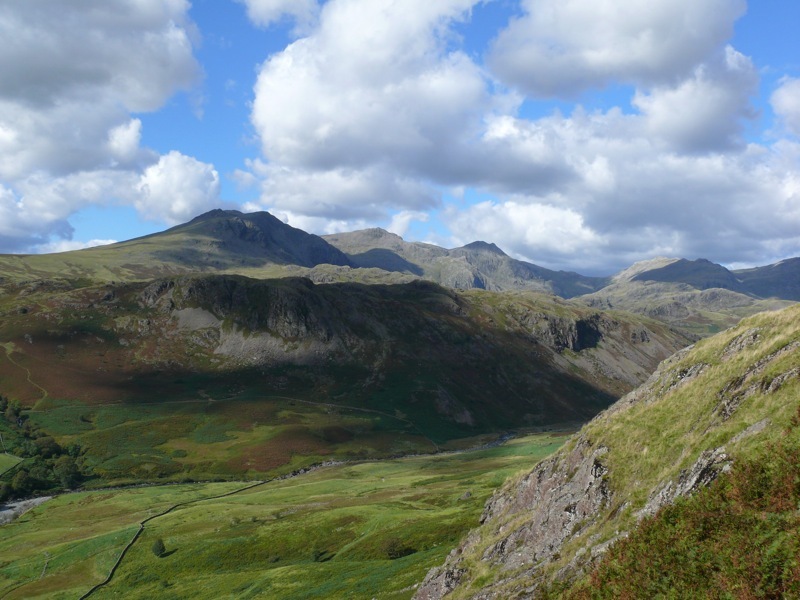 After that, it was over the pass to the bleak valley between the Wrynose and Hardknott Passes, and on through Wrynose to Ambleside. We'd planned to go to Keswick, but it was getting late, so we stopped in Ambleside. It was windy up the pass! We had a mini-expedition to get a baby rucksack carrier from a shop that actually knew about them, and ended up walking away with a 'bush baby' carrier and some sound advice. The shop was called The Outdoor Family for Kids and I heartily recommend it. Great advice, opportunities to try the carriers and patience as we made up our mind. After this, we had a meal at a Cinema and Jazz Club and Restaurant called Zefferilli's. It did get a little embarrassing when Nathan started to sing to the songs, but I'm sure they preferred that to him crying. After that, we headed back over the Passes to take some pictures of the sun setting and return home. The day ended with a call from a friend I first met 16 years ago when I was working up at Sellafield during my year out. We'd called in to see them on Saturday, but they weren't around, but we'd left the cottage number. We're planning to meet up on Thursday, which will be a great finish to the holiday. We're away in the Lake District for a week, in what is best described as a communications desert. No broadband, no mobile signal, no outgoing phones. Even the TV has to be satellite to get a signal! Fantastic! As a result, this is going to be posted somewhat retrospectively! 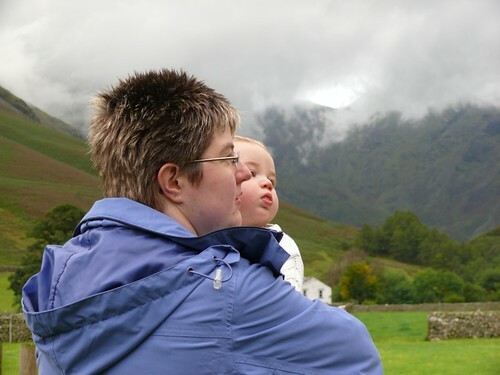 Jill and Nathan at Wasdale Head. We've taken a cottage in Eskdale, in the village of Boot, called Orange Hill Cottage. There aren't any oranges, and it's surrounded by hills rather than being on one, but it's rather nice. Jill found it on the internet. As well as the three of us, Jill's Mum and Dad, and her sister Paula and her fiancé Mark have come along. The cottage has a fantastic kitchen, and a lovely living area. We got here around 5 o'clock last night, ahead of everyone else, so got the pick of the rooms and a chance to settle Nathan down properly. It did show how times have changed though. In the past, had we arrived and unloaded the car at a place like this with an excellent looking pub opposite we would have probably headed over the road and got a meal and a few drinks. However, now we're responsible adults (! ), Nathan insisted that we stay in feed, bath and put him to bed. He went to sleep like a dream. Everyone else arrived around eight thirty after a nightmare journey, which I suppose was to be expected on the last weekend of the school holidays. They'd just missed the smoke alarm drama (we'd had to disable the mains alarms as they were on the blink and replace them with battery based ones that were delivered by the owner's agent last night) and had also missed the turning for the village (something we'd done in daylight earlier on). We were up again at 3 AM, as Nathan is teething again. We found two upper front teeth erupting last night and he was in lot of pain. We got back to sleep by 4 AM, and mercifully got a thirty minute lie in to 7:30 as he was tired. I'm not certain what today will bring, but I'm sure it'll be a great change to normal. I'm hoping we can catch up with some of my friends I made when I worked up here mumble 16 mumble years ago! As an aside, I've just finished The English Patient, following its name-check in Pulp Egypt. I've never seen the film, and the book was interesting as it only really came together towards the end. I don't think its one I'll keep, but I will check out the film. Sadly, had I known it I couid have programmed the PVR at home to snag it as FilmFour has it on this week. That's the perils of getting the listings magazines later on! Currently feeling: Tired but relaxed. Currently listening to: Radio 4 via the Sky Box.